GLENDALE, Calif., March 12, 2018 /PRNewswire/ -- Applebee's Neighborhood Grill + Bar® is putting guests in the driver's seat when it comes to convenient and delicious meals to go. Updates to Applebee's To Go experience makes bringing home menu favorites even easier, and to sweeten the deal, Applebee's is offering guests $10 off $30 on their next order on Applebees.com or mobile app for a limited time*. Applebee's was one of the first restaurants in its category to offer Carside To Go® and now thanks to a redesigned mobile app and online ordering platform, options for Applebee's To Go are faster, more accurate and more satisfying than ever. Guests can dash inside and grab their meal for Carry Out or choose Carside To Go at participating restaurants to get their meal delivered straight to their car. No matter the method, new To Go packaging ensures the meal remains hot and tasty outside of the restaurant. 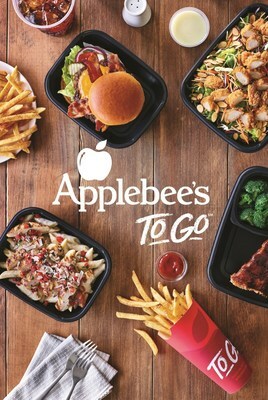 "Applebee's To Go has undergone a makeover aimed at better serving guests, with updates to the mobile app and website, the introduction of new To Go packaging and an elevated focus on operational execution, all done to improve the guest experience," said Scott Gladstone, vice president, strategy & off-premise at Applebee's. "These enhancements are paving the way for new innovations in the To Go space that will enable Applebee's to continue evolving its excellent service and be more competitive in off-premise eating occasions." To take advantage of the offer for $10 off your next Applebee's To Go order of $30 or more*, guests can order online at applebees.com/togo or through Applebee's mobile app and use promo code 10off30. * Valid for 1 time use only and limit 1 per order. Tax and gratuity excluded. Not valid with other coupons or discounts. No cash value. Expires 4/28/18. Online and mobile app orders only. At participating restaurants. Further restrictions may apply.